Impassioned arguments from supporters of Jimmy’s Music Club on Willow Street could not dissuade the New Orleans City Council from unanimously voting in favor Thursday of a moratorium on new alcohol permits in the Carrollton area, as city leaders insisted that their action does not preclude the revered Uptown venue from reopening. Beginning by describing himself “as New Orleans as a mirliton and a po-boy sandwich,” club owner Jimmy Anselmo said he founded his nightclub in the 1970s in a former pool hall frequented by methadone junkies, and over the years transformed it into an institution that drew thousands of music fans to the corner of Willow and Dublin streets. Now, he says, he had hoped to depend on revenue from the club into his retirement, even as he fights prostate and bladder cancer that may spread to his bones. “I have followed all the rules, and you are trying to change them to my disadvantage,” Anselmo said, tearing up so much that his wife had to finish reading the rest of his remarks to the council. Musician “Deacon John” Moore, president of the New Orleans Musicians’ Union, spoke in favor of reopening Jimmy’s, saying that musicians need more places where they can earn a living with their music. “This club has a unique history of being an incubator for the preservation and promotion of our indigenous music culture in this great city that we all love so dearly,” Moore said. While expressing her respect for Anselmo, Moore and the club’s history, Guidry said that the bar’s recent history does not reflect the heritage ascribed to it. For the past several years, Anselmo leased the building to a bar called the Frat House, where a NOPD raid last summer found 29 underage drinkers inside and was on the verge of being shut down by the city when it closed, Guidry said. Unruly Frat House patrons were frequently blamed for property damage in the surrounding blocks, Guidry said, and Anselmo was the landlord the entire duration of such disruptions to residents’ quality of life. The current proposal is not even for Anselmo to run the new club, but to lease it to another operator called Lucky Tab about which very little is known, Guidry said. Ultimately, Guidry said, the moratorium will not prevent Jimmy’s or any other establishment in the broad area it covers from getting a liquor license. They can seek a waiver for the moratorium, which will require them to hear the neighborhood’s concerns and stand up to City Council scrutiny, just as the other establishments that have obtained alcohol licenses in the last two years of the moratorium have done. 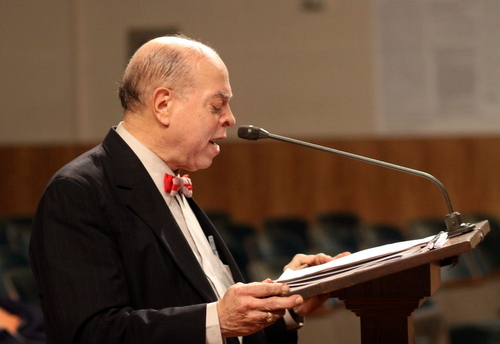 Four City Council members — Jackie Clarkson, Stacy Head, LaToya Cantrell and Kristen Gisleson Palmer — all spoke in favor of the moratorium as a bridge to the new Comprehensive Zoning Ordinance, while encouraging Anselmo to apply for a waiver. The measure passed with a 7-0 vote. After the meeting, Anselmo chafed at the notion of the moratorium — saying its imposition had devalued his property — and felt it unfair that his club should face such an obstacle. Mike Tifft, attorney for Anselmo and proposed operator Lucky Tab, said that his clients are now weighing whether to apply for a moratorium waiver, as suggested by the council members, or to challenge the moratorium’s legality on the grounds that it is too similar to the one in place for the past two years. To read our live coverage, see below. What a joke. As a property owner in the neighborhood, I would love to see Jimmy’s reopen. Why is this club being singled out? The new owner should have gone to the neighborhood association first, and Jimmy should not have allowed the Frat House to be such a hole, but give me a break, this building has been a nightclub for 30 years. There should be a moratorium for new clubs only. This is simply a change of management.